AMV with director Tom Tagholm, show us the emotive power that comes with sound in this latest spot for Mercedes. The Mill collaborated with AMV and Blink to enhance the in-camera LED light patterns with luminosity and lens flares which helped to exaggerate the emotional response to the audio heard by the driver. Tom Tagholm directed this new spot for Mercedes which explores how sound can incite a range of emotions. 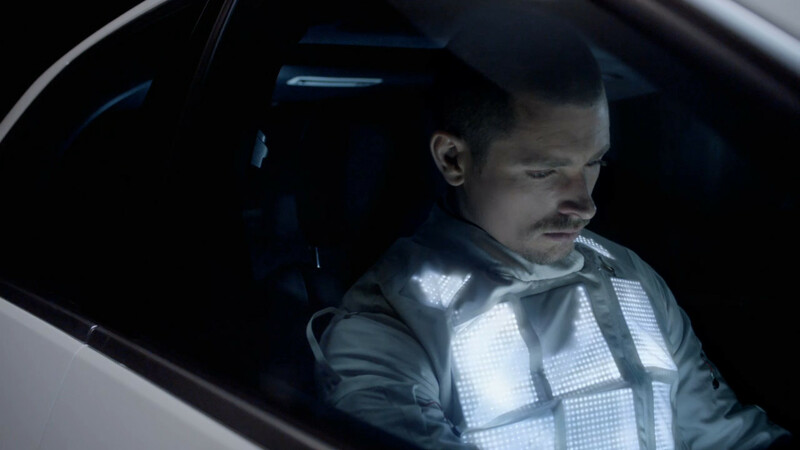 It features a driver fitted with an LED suit that indicates his emotional response to sounds, with each emotion causing different light patterns on the LED panels. Through-out the film he is played various evocative sounds such as a baby giggling, crashing waves, Sting Ray and the sound of the new Mercedes-Benz E 63 AMG engine. Each emotional response causes the suit to light up in a different way. All of these audio visuals then come together in a climactic mash up backed by Tinie Tempa's 'Pass Out', as we see the driver's suit light up in full when he revs the engine of his Mercedes. This was carefully crafted in Flame by Pete Rypstra with the help of Brad Wood and then expertly graded by Seamus O'Kane. The film is complimented by an online site created by AMV & B-Reel which allows the web user to create their own Mercedes mash up complete with Tiny Tempah and Sting Ray clips.